Already back in the 1970's when the monopoly of wood in the naval building industry was starting to waver, they were saying that light alloy was one of the most promising alternatives. If what followed saw the rampant success of fibreglass, it is only because the working of metals - especially aluminium based ones - required, then as now, a knowledge similar to that of carpenters who worked on the most valued of wood and a highly superior technology. But the principles remain the same: light aluminium alloy does in fact guarantee an absolutely excellent resilience/weight ratio (in other words, the resistance to impacts according to the thickness), an anti-fouling action (for the chemical process of passivation) and a potentially unlimited duration. This is why those who know how to handle this material, and have the right machinery for welding it, undoubtedly end up by building very special hulls. This obviously relates to their intrinsic characteristics and not infrequently to the quality and originality of the projects and design. This is the case with the C-100, an original semi decked large ship's boat that the Fgg shipyard has designed as a tender for yachts. The aesthetic- functional layout of the hull brings to mind the runabouts that made famous the shipyards in the lakes of the Lombardia region, especially in the 1960's. In fact, the company established itself right in Albese con Cassano, right at the heart of the province of Como that saw the creation - throughout the centuries - of one of the most important naval carpentry traditions in our country. We were, however, talking about the aesthetic imprint, that obviously manifested itself particularly in the dead works lines. The most conspicuous element here is made up of the "tumble home" on the stern sections (basically, the beam to the gunwale is less than that measured at waterline) that elegantly contrasts with the strong V flaring of the bow sections. The semi-deck that runs for about half the length, from amidships to bow, creates an extremely large peak and, in particular, acts as a support for the exceptionally large sunbathing area. The cockpit, that enjoys similar large dimensions, has a long "U" perimetric bench and a low central consul with driving armchair for two. Its maximum capacity is ten people. 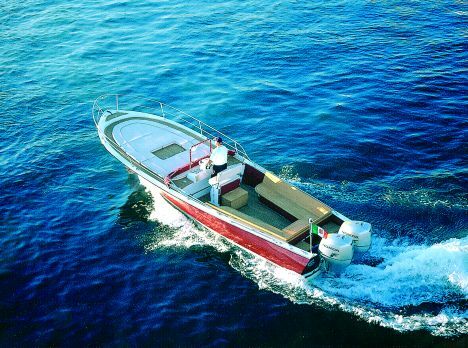 The standard engine consists of a pair of 150 hp 4 stroke outboard engines: not an impressive power but enough to allow the C-100, with an average load to easily reach a considerable maximum speed of 40 knots. Shipyard: FGG, 22032 Albese con Cassano (Como), tel.031 428137, fax 031 428906. Web site www.fggguarisco.com; e-mail gclod@tin.it.